Statistics Canada has undertaken a joint project with the Canada Mortgage and Housing Corporation to develop a framework designed to address data gaps related to housing. Data from the CHSP revealed that non-residents owned 3.4% of all residential properties in the Toronto census metropolitan area (CMA), while the value of these properties accounted for 3.0% of the total residential property value in that metropolitan area. In the Vancouver CMA, non-residents owned 4.8% of residential properties, accounting for 5.1% of total residential property value. 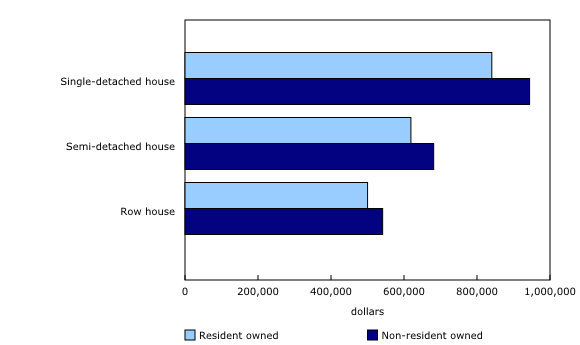 Estimates of non-resident ownership varied by property type. In both metropolitan areas, non-resident ownership was more prevalent for condominium-apartments. 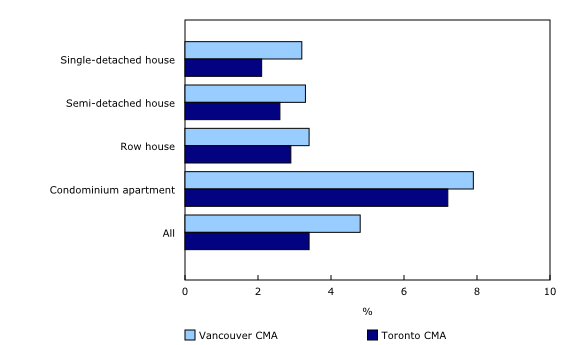 Non-residents owned 7.2% of condominium-apartments in the Toronto CMA and 7.9% of these units in the Vancouver CMA. By comparison, non-residents owned 2.1% of single-detached houses in the Toronto CMA, and 3.2% of single-detached houses in the Vancouver CMA. For a more detailed report on the residential property holdings in both CMAs, see the article "Non-resident Ownership of Residential Properties in Toronto and Vancouver: Initial Information from the Canadian Housing Statistics Program" from the publication Economic Insights (Catalogue number11-626-X). This release is also accompanied by two infographics, one for the Vancouver CMA and one for the Toronto CMA. Over the past decade, home prices have accelerated markedly in Canada's largest urban areas, particularly in Vancouver and Toronto. Data from the Canadian Real Estate Association Home Price Index show prices increased 173.7% in Vancouver from January 2005 to November 2017, while they rose 145.0% in Toronto over the same period. The last three years have been particularly telling, with house prices in Vancouver increasing by more than 60% and in Toronto by more than 40%. Housing affordability is an important issue for Canadians, prompting governments to obtain better data to inform policy. Non-residents of Canada owned 4.8% of the residential properties in the Vancouver CMA and 3.4% in the Toronto CMA. Breaking down the CMAs by municipalities, across the Vancouver CMA, non-resident ownership was most concentrated in the City of Vancouver (7.6%), followed by Richmond (7.5%) and West Vancouver (6.2%) (Table 1). In the Toronto CMA, the shares of non-resident owned properties were largest in the municipalities of Toronto (4.9%), followed by Richmond Hill (3.6%) and Markham (3.3%) (Table 2). The largest share of non-resident ownership in both CMAs was for condominium apartments, at 7.9% in the Vancouver CMA and 7.2% in the Toronto CMA (Chart 1). 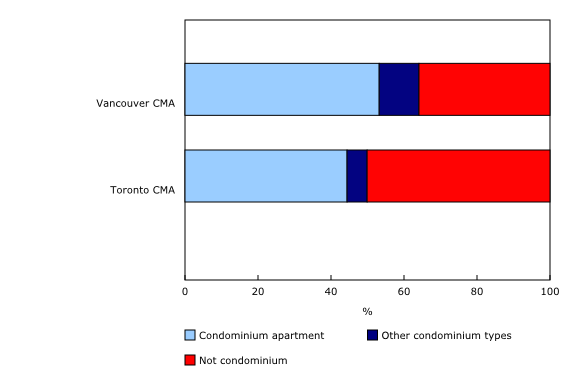 In the Vancouver CMA, almost two-thirds of non-resident owned properties were condominiums, while in the Toronto CMA, this share was close to half (Chart 2). Over 80% of these condominiums were apartments in the Vancouver CMA, whereas in the Toronto CMA, this share was higher at nearly 90%. It should be noted that although the majority of condominiums were apartments, some were also single-detached houses, semi-detached houses and row houses. Across the Vancouver CMA, 50.1% of condominium-apartments owned by non-residents were in the City of Vancouver, while 14.9% were in Richmond. In the Toronto CMA, non-resident owned condominium-apartments were primarily located in the City of Toronto (82.8%) and Mississauga (8.6%). In the Vancouver CMA, the average value of a condominium-apartment owned by non-residents was 30.4% higher than that of a resident owned condominium-apartment (Chart 3). The City of Vancouver had the highest rate of non-resident ownership of condominium-apartments within the CMA. The average value of these apartments was approximately $930,600, which was 25.6% higher than resident-owned. In the Toronto CMA, non-resident owned condominium-apartments were on average 8.7% more expensive than resident owned. The City of Toronto had the highest concentration of non-resident owned condominium-apartments in the CMA, which were on average valued at $439,000, or 7.6% more expensive than resident-owned. A property with one residential unit refers to a property containing only one set of living quarters, such as a single-detached house, semi-detached house, row house or condominium-apartment. Across the Vancouver CMA, the average value of each of these property types was higher for non-resident owned properties than resident owned, with the disparity greatest for single-detached houses. 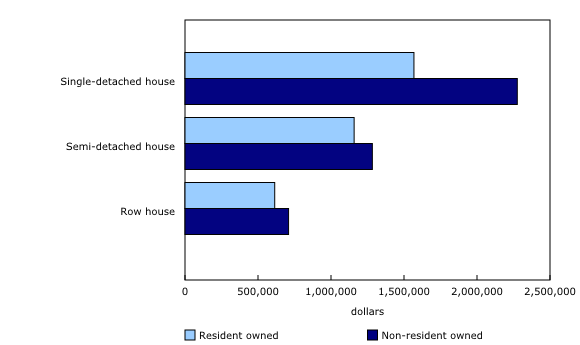 The average value of a single-detached house owned by non-residents was approximately $2.3 million compared with $1.6 million for resident owned (Chart 4). These differences were most pronounced in the Greater Vancouver A subdivision, the City of Vancouver and West Vancouver. In Greater Vancouver A, single-detached houses owned by non-residents had an average value of nearly $8 million, while those owned by residents had an average value of $5.3 million. The average size of a single-detached house owned by non-residents in this district was close to 4,800 square feet, 32.2% larger than the average size of single-detached houses owned by residents. 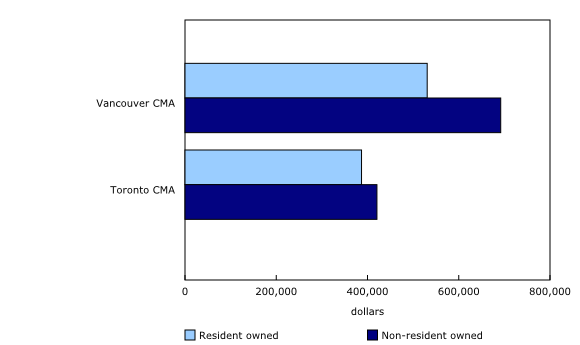 In the Toronto CMA, the average value of properties with one residential unit was also higher for those owned by non-residents versus resident owned, with the divergence greatest for single-detached houses (Chart 5). Single-detached houses owned by non-residents were on average 12.3% or $103,500 more expensive than houses owned by residents. Differences in average values for single-detached houses were most marked in the municipalities of Markham, Richmond Hill and Toronto. In Markham, the average value of single-detached houses owned by non-residents was close to $1.1 million compared with $997,500 for resident owners. In Richmond Hill, non-resident owned single-detached houses were, on average, valued at $1.2 million compared with $1.1 million for resident owned houses. In the City of Toronto, a non-resident owned single-detached house was, on average, valued at just over $1 million compared with $965,800 for a resident owned house. Statistics Canada and the Canada Mortgage and Housing Corporation (CMHC) are working together to improve housing-related data in Canada. One example of this partnership is the Canadian Housing Statistics Program (CHSP), which provides a coherent and consistent structure to measure the ownership, property and financing characteristics of the residential real estate sector in Canada. In order to address the data gap on the share of non-resident ownership in Canadian residential real estate, CMHC began collecting information in 2014 on the non-resident share of ownership in condominiums via its Condominium Apartment Survey. As a result, CMHC has produced estimates for selected major centres since 2014, including the census metropolitan areas (CMAs) of Toronto and Vancouver. In Budget 2017, the Government of Canada provided funding to Statistics Canada to improve housing data through the CHSP. These efforts have resulted in Statistics Canada publishing its first estimates from the CHSP focusing on non-resident ownership for Vancouver and Toronto. Statistics Canada and CMHC both define a non-resident homeowner (often expressed as a "foreign homeowner") as an individual whose principal residence is outside of Canada. "Foreign ownership," in this case, technically refers to the non-Canadian residency of the legal owner of the property, irrespective of the owner's citizenship. It should be noted that this definition would classify Canadian citizens whose primary residence is outside of Canada as a "non-resident." The key methodological differences between Statistics Canada and the CMHC approaches for measuring non-resident ownership of condominium-apartments are as follows. Statistics Canada uses various administrative data sources to identify residency such as land titles, property assessment data, census of population, tax and Business Register data. CMHC obtains information on non-resident ownership through telephone interviews of the property management company or condominium (strata) board, or building superintendent, which may be supplemented by site visits if no telephone contact is made. Statistics Canada includes individuals and corporations in its estimate of non-resident owners. CMHC only focuses on individuals. CMHC's estimates of non-resident ownership cover only apartment-condominiums, while Statistics Canada covers apartment-condominiums and various other housing types, including non-apartment condominiums, single-detached homes, semi-detached homes, row houses and vacant land. Statistics Canada's approach is comprehensive in gathering data on non-resident ownership in Canadian housing markets. In the future, Statistics Canada will continue to extend its coverage to other centres in consultation and collaboration with CMHC and others, eventually replacing CMHC's collection of non-resident ownership data. In the interim, there are differences in the estimates for the share of non-resident condominium-apartment ownership in Toronto and Vancouver in 2017 between Statistics Canada and CMHC. The explanation of the differences, as shown above, lies in the different data sources and methodology used by Statistics Canada and CMHC. As a result, point-estimates for the 2017 share of non-resident ownership of condominium-apartments in the CMAs of Toronto and Vancouver (and their sub-areas) should be taken from Statistics Canada's results, reflecting Statistics Canada's more comprehensive methodology. However, CMHC's time series of estimates for Toronto and Vancouver should be relied upon for insight into the general trends in non-resident ownership since 2014 and for comparison between cities. The results of the CMHC study are available in the Housing Observer Online. In an effort to rein in housing prices and work toward greater affordability, the government of British Columbia passed legislation that required foreign purchasers to pay a 15% tax on properties in Metro Vancouver in August 2016. Similarly, the government of Ontario passed the Fair Housing Plan in June 2017, which included a 15% non-resident speculation tax imposed on foreign buyers of property in the Greater Golden Horseshoe. This is the first publication under The Canadian Housing Statistics Program (CHSP) and includes data on 22 municipalities in the Vancouver census metropolitan area (CMA) and 23 municipalities in the Toronto CMA. The CHSP's residential property database is a comprehensive repository of statistics intended to address data gaps in the Canadian housing market and to support decision makers in designing evidence-based policies. CHSP data are based entirely on administrative files which are combined from multiple sources such as property assessment rolls, land titles, tax data, census data and other data files. Steps were taken to consolidate and standardize variables originating from the various data sources. Data abnormalities were resolved in collaboration with data providers and also by comparing with other existing data sources. CHSP data underwent various levels of quality assurance from internal checks during data production to sampling for detection of linkage errors. Final results were subjected to manual review to estimate error rates. A follow-up survey is being planned to corroborate residency status and other characteristics of property owners. The data published today provides detailed information on the structure of the residential property market as of May 2017 for Toronto CMA and as of June 2017 for Vancouver CMA. This includes information at the municipal level on the residency status of homeowners, type of residential property, period of construction, living area and other indicators. Subsequent publications will expand in terms of geographical coverage and variables contained. The final database, which is expected to be fully populated by December 2022, will include information on all municipalities in Canada and provide time series data to monitor the evolution of the housing market in different CMAs over time. Residential property consists of all land and structures intended for private occupancy, whether on a permanent or a temporary basis. Vacant land on which residential structures can be built is thus classified as residential property. Examples of residential structures include single-detached houses, semi-detached houses, and condominium-apartment. Property type refers to the type of residential structure present on the property, that is, whether the structure is a single-detached house, a row house, a condominium-apartment and so on. Note that not all residential structures may be accounted for, given that some properties are still being assessed. Condominium-apartment refers to a set of living quarters that is owned individually, while land and common elements are held in joint ownership with others. Condominium status refers to whether the residential structure is part of a development whereby units are individually owned while land and common elements are held in joint ownership with others. Value refers to the assessed value of the property for the purposes of determining property taxes. It is important to note that the assessed value does not necessarily represent the market value. Given that different provinces and territories have their own assessment periods and durations of the valuation roll, it is difficult to make exact comparisons of similar properties from one province or territory to another. For properties that are being utilized for both residential and non-residential purposes, only the residential value has been taken into account. The assessed values represented for the CMA of Vancouver are as of the latest assessment date of July 1, 2016, while the assessed values represented for the CMA of Toronto are as of January 1, 2016. Residency status: The definition of residency status of property owners in the Canadian Housing Statistics Program (CHSP) is coherent with the internationally recognized concept of residence used in the Canadian System of Macroeconomic Accounts. Infographic 1 provides examples of residency status and citizenship for individuals. Individuals: The CHSP defines individuals as Canadian residents if they maintain their principal dwelling in the economic territory of Canada. Being present for at least one year qualifies as having a principal dwelling in that territory. Conversely, individuals are considered non-residents of Canada if they maintain their principal dwelling outside the economic territory of Canada. Non-individuals: The CHSP defines non-individuals, such as corporations, trusts, stated-owned entities or related groups, as Canadian residents if they engage in economic activities from a location in the economic territory of Canada. Conversely, non-individuals are considered non-residents of Canada if they do not engage in economic activities from a location in the economic territory of Canada. A property is considered "owned by residents" when the majority of owners is defined as resident. Conversely, a property is considered "owned by non-residents" when the majority of owners is defined as non-resident. In the situation of an equal number of resident and non-resident owners for the same property, the property is classified as "owned by residents". Living area refers to the residential living space within a structure. For residential structures that have a basement, the finished basement area is included in the total living area, while unfinished basement area is not included. The living area is measured in square feet. Greater Vancouver A is a unique part of the Vancouver CMA that ranges from urban, suburban, seasonal use, to rural and remote areas. The majority of the population is located at the University of British Columbia and the University Endowment Lands. For more information, visit this website: http://www.metrovancouver.org/services/electoral-area-a/pages/default.aspx. The research article "Non-resident Ownership of Residential Properties in Toronto and Vancouver: Initial Information from the Canadian Housing Statistics Program," which is part of the Economic Insights series (Catalogue number11-626-X), is now available. The infographics "Non-resident owned properties in the Vancouver CMA" and "Non-resident owned properties in the Toronto CMA", which are part of Statistics Canada - Infographics (Catalogue number11-627-M), are also available.